Why is the Democratic Party making peace in Korea more difficult? Last month, I took part in an international women’s peace delegation to South Korea, led by Nobel Peace Laureate Mairead Maguire and Women Cross DMZ founder Christine Ahn. It was my first visit to my native Korea in over three years. Everywhere I went, I witnessed the afterglow of the inspiring candlelight movement that restored democracy to the country last year, and I sensed the deep conviction with which Koreans support the current peace process initiated by President Moon Jae-in. What initiated the Panmunjom Declaration was the completely non-violent and peaceful civil revolution in 2016 that began with orderly marches of demonstration with warm candlelight through the winter. The candlelight revolution was a true example of the UN’s Culture of Peace. In addition to meeting with diplomatic representatives from the United States, UK Japan, Sweden, and Canada, we participated in an all-day peace symposium at the National Assembly side by side with South Korean women peace activists. 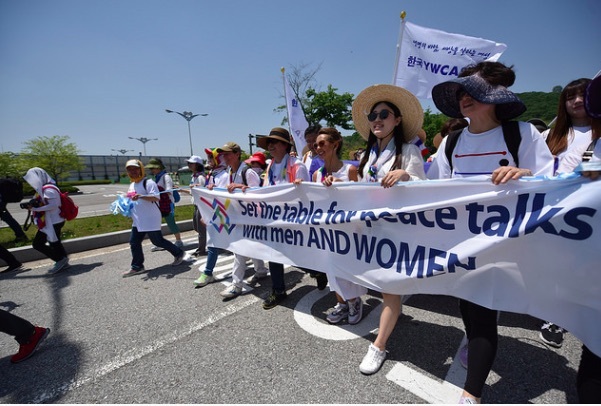 One of our South Korea colleagues commented that while women have been conspicuously absent from the process of war-making in the Korean peninsula (at least from a policy standpoint) they most certainly ought to be part of the peace process. Returning to the United States however, I found a starkly different reality in the sustained rightwing attacks on the peace process and even the very idea of a peace treaty. Pundits, neocon hawks, and corporate media have been promoting an aggressively maximalist standard according to which North Korea must give up its entire nuclear weapons program before any serious discussions can take place. In this dialogue, the four million Korean and 35,000 American lives lost to the Korean War, as well as the 80 million Koreans whose lives would hang in balance in any renewed conflict, are presented as mere footnotes. North Korea in particular, where poverty is rampant and 25% of children suffer from malnutrition, is presented as the perpetually “threatening other,” fully deserving to suffer from US-led sanctions. American exceptionalism is celebrated without reservation. In a recent declaration, seven leading Democratic senators continued this disregard for the interests of Koreans themselves in this nominally inter-Korean conflict with their demand that President Trump hold to a hard line in any negotiations with North Korea. The letter – signed by Senators Bob Menendez, Chuck Schumer, Richard Durbin, Mark Warner, Diane Feinstein, Patrick Leahy, and Sherrod Brown – completely overlooked the recent progress toward peace of the inter-Korean summit and the Panmunjom Declaration, and discounted the overwhelming support for the current peace process by Koreans. The letter offers no alternative vision for peace on the Korean Peninsula and considers Korean interests only insofar as they serve the narrow political agenda of the Democratic Party. The April 27 Declaration of the two Koreas was a historic event, which promises a bright future for the people of Korea. It calls for the two Koreas to settle their problems “on their own accord” and lays out a careful schedule to proceed, something quite new. It also calls on the international community (meaning Washington) to support this process. Unfortunately, the signals from Washington are at best mixed. National Security Council advisor John Bolton, who has called for bombing North Korea at once, and Vice-President Mike Pence both invoked the “Libya model,” knowing full well its import. President Trump cancelled the Singapore summit a few hours after North Korea had destroyed its main testing site as an important gesture of conciliation. But these are pitfalls, not termination of the process. With determination and good will the two Koreas can move forward with the plans outlined in the Declaration. It is the task of the people of the United States to support them in this historic endeavor and to ensure that their own government does not undermine or in any way impede the process. That can succeed. It must succeed, for the welfare of Korea, and all of us. Noam Chomsky is right in pointing out that this initiative carried forward by the two Koreas is in fact “something quite new.” The minimum that the United States can do at this historic moment is to refrain from harming the inter-Korean peace process. It’s time that American politicians, both Democratic and Republicans, give Koreans a chance to shape their own destiny.